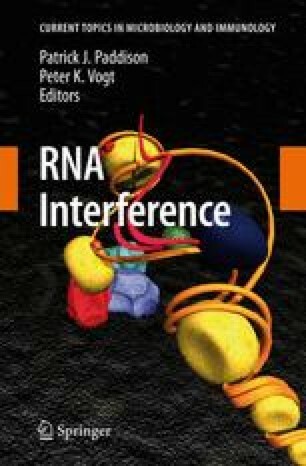 Members of the Ribonuclease III (RNase III) family are double-stranded (ds) RNA-specific endoribonucleases, characterized by a signature motif in their active centers and a 2-nucleotide (nt) 3′ overhang in their products. Dicer functions as a dsRNA-processing enzyme, producing small interfering RNA (siRNA) of approx. 24 nt in length (approx. 20-basepair RNA duplex with a 2-nt 3′ overhang on each end). Bacterial RNase III functions not only as a processing enzyme, but also as a binding protein that binds dsRNA without cleaving it. As a processing enzyme it produces siRNA-like RNA of approx. 13 nt in length (approx. 9-basepair duplex with a 2-nt 3′ overhang on each end) as well as various types of mature RNA. Dicer is structurally most complicated member of the family; bacterial RNase III is comparatively much simpler. One structure is known for Dicer in its RNA-free form (MacRae, Zhou, Li, Repic, Brooks, Cande, Adams, and Doudna, Science 311:195–198); many structures are available for bacterial RNase III, including the first catalytic complex of the entire family (Gan, Tropea, Austin, Court, Waugh, and Ji, Cell 124:355–366). In light of the structural and biochemical information on the RNase III proteins and the structure of a non-Dicer PAZ (Piwi Argonaute Zwille) domain in complex with a 7-basepair RNA duplex with a 2-nt 3′ overhang on each end (Ma, Ye, and Patel, Nature 429:318–322), the structure and function of Dicer is being elucidated.